August 30, 2012 - NTSB investigation has determined that pilot error and water contamination in the fuel tanks of a BEECH 200, registration: N849BM were the reasons for five killed at Long Beach Airport on March 16, 2011. Onboard were businessmen and community leaders and the pilot; Mark Bixby, 44, Thomas Dean, 50, Jeff Berger, 49, Bruce Krall, 51, Mike Jensen, 51, and pilot Kenneth Cruz, 43. Jensen survived the crash with severe burns. The passengers were on their way to a ski trip in Salt Lake City, Utah. Initially the NTSB believed that the twin-engine Beechcraft King Air was over its weight limit by 650 pounds. 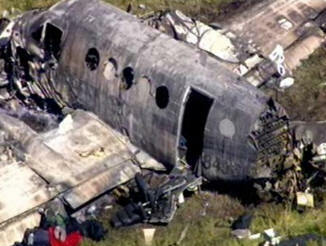 However, in the NTSB final report indicated the added payload wasn't a contributing factor. In mid-February 2012, an FAA inspector from the Long Beach Flight Standards District Office (FSDO) was giving a Part 135 check-ride to a line pilot employed by West Coast Charters, Santa Ana, California. The inspector noticed that, during the pilot’s preflight of a King Air 200 airplane, he did not drain the airplane’s fuel tank sumps. When he questioned the pilot about it, the pilot responded with “we [pilots] don’t do that, the mechanics do that.” The inspector pointed out to the pilot that the Pilot’s Operating Handbook for the airplane requires that the King Air’s 12 fuel tank sumps be drained during preflight before every flight. Follow-up communications between Long Beach FSDO inspectors and the Chief Pilot of West Coast Charters verified that this was standard practice. The DM for West Coast Maintenance said the King Air’s fuel system has several tanks or cells, which feed the engine’s nacelle inverted “L” shaped (57 gallon) fuel tank. He said maintenance personnel are required to open the nacelle tank every 24 months for inspection and cleaning. When this is done, it is common to find water, debris, and biomicrobial contaminants in the tank. He said the entire engine’s fuel supply must flow to the bottom of this tank. The DM said that regular draining of the King Air’s 12 fuel tank sumps would minimize the water and debris found in the nacelle tank upon inspection. The DM said that, during the accident airplane’s departure, as the airplane rotated for takeoff, if water was present in the bottom of the nacelle tank, it would shift aft covering the fuel intake port to the engine. This “slug” of water would then flow to the engine’s 14 fuel nozzles, where it could extinguish the engine’s fire; the engine would stop producing power and its propeller would move from coarse to fine pitch. Subsequently, jet fuel would follow the water, and the engine’s internal heat would likely be sufficient to relight the atomized fuel. The engines were equipped with auto ignition systems, and if they were in the on position, they may also have been triggered to relight the engine. The DM believes that the two pops he heard were attempts by the engine to relight the reintroduced fuel. He said that each pop would have been accompanied by grayish white smoke. The DM also said that water found in airplane fuel tanks does not necessarily come from contaminated fuel trucks. Airplane refueling trucks have stringent checks and documentation requirements of their filters and are subject to regular tank sump sampling. He believes that the biggest source of introduced water into fuel tanks is daily temperature variations and atmospheric temperature variations. That is, if a fuel tank is not completely full, there is a cavity of air above the fuel, and due to the tank’s venting system, the air in that cavity will move in and out as daily temperature rise and fall, or as the airplane climbs to cruise altitude and descends at its destination. The United States Air Force has a fuels engineering research laboratory located at Wright-Patterson Air Force Base. One of their Senior Research Engineers stated that “the cavity above fuel in a partially filled fuel tank is vulnerable to aircraft fuel tank breathing through its vent system. This breathing of air, in-and-out, causes water to condense within the fuel tanks.” He said that there are many variables which affect this phenomenon, including: diurnal temperature and pressure variations, flight altitude pressure variations, relative atmospheric humidity, fuel tank size and volume above the fuel, and fuel storage time. The senior engineer further stated that good housekeeping practices of an airplane’s fuel source and regular draining of the fuel tank sumps is the simplest way to reduce the presence of water in aircraft fuel tanks.